Unsworth fills us in on the the newest updates to Facebook that businesses and entrepreneurs can utilize to get their message out and shares ways to get “targeted Facebook Likes” from people in intended audiences, FAST. He then discusses how people can leverage a page with many Likes to improve the bottom line. The conversation then turns to financial literacy. Unsworth has raised nearly $7,000 to purchase 100 Kindle eReaders for extended foster children ages 18-21 to promote reading and inspire entrepreneurship. He believes young adults are often pushed out of the “system” and forgotten about due to their age. Narrator: Speakers, publishers, consultants, coaches and infomarketers unite. The Speaking of Wealth Show is your roadmap to success and significance. Learn the latest tools, technologies and tactics to get more bookings, sell more products and attract more clients. If you’re looking to increase your direct response sales, create a big time personal brand, and become the go to guru, the Speaking of Wealth Show is for you. Here’s your host, Jason Hartman. Jason Hartman: Welcome to the Speaking of Wealth Show. This is your host, Jason Hartman, where we discuss profit strategies for speakers, publishers, authors, consultants, coaches, infomarketers and just go over a whole bunch of exciting things that you can use to increase your business, to make your business more successful and more and more passive and more and more automated and more and more scalable. So, we will be back with a great interview. Be sure to visit us at SpeakingofWealth.com. You can take advantage of our blog, subscribe to the RSS feed and many other resources at SpeakingofWealth.com and we will be back with a great interview for you in less than 60 seconds. 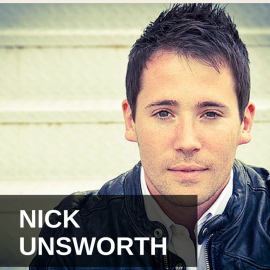 Jason Hartman: It’s my pleasure to welcome Nick Unsworth to the show. Nick is the CEO of Life on Fire and he is a Facebook marketing expert, coming to us from beautiful San Diego, California. Nick, welcome. How are you doing? Nick Unsworth: I am doing great, man. And it is sunny and it is beautiful out here. Blue sky and I think there’s like one cloud in the corner. Jason Hartman: Fantastic, fantastic. Well, you certainly pay enough for it there. Nick Unsworth: Very true, very true. Jason Hartman: Well, hey, Facebook advertising really seems to be just a very hot topic nowadays. Google ads not so much anymore – the action seems to really be in the Facebook arena. Tell us a little bit about it and what parts of it you really like nowadays. Nick Unsworth: Absolutely. And I think that you’re absolutely right that Facebook advertising, I’ve been doing this for about 5 years, and it’s been explosive group and our business isn’t for our clients because Facebook advertising hits that sweet spot, right, so it’s kind of like there’s a time where if you’re doing SEO on Google or AdWords on Google, there’s that point at which it’s like buying media through that network – it’s a bargain. So, right now, Facebook advertising, the traffic is inexpensive. Now, 2 years from now, it may cost 3 times as much and you may not be able to put in $1000 and get $10,000 back out like we’re doing for many of our clients. So, right now the great thing is that we’re finding that it’s working in quite a few different niches. So, we’re absolutely crushing it in information marketing. We’re working with coaches…Whether you’re building a podcast or you’re building an information marketing business or you’re a coach or a guru, anyone that is teaching you something or building an expert or a personal brand, it is absolutely phenomenal, even fitness professionals, local businesses, corporations. I find that the only niche that I have a hard time with is physical products because on Facebook we need to build rapport first. And once you build rapport and you connect with them as a person, then we’re finding that from that process it’s relatively easy to then take that person, if you have them opt in, give them your email address, and then add some value for them. And then at that point, typically sell them something a little bit further down the sales cycle. Jason Hartman: So, what areas are hot for Facebook? I mean, what types of products I should say? Digital products, not physical products, but any particular verticals there? Nick Unsworth: Yeah. So, I mean, as far as verticals go, I mean health and fitness is phenomenal. Teaching folks about how to build a business is a great niche. Anything in real estate is really, really hot. Dating and relationships is absolutely an incredible market to be in. So, it’s a pretty wide, vast range. Real estate is great. If you’re selling a service or you’re selling information or coaching, it’s phenomenal. If you’re selling necklaces or you’re selling jewelry, that physical product is gonna be a little bit more challenging. Jason Hartman: So, pretty much wide open then as long as it’s not physical products. Now, what’s the problem with physical products? Just the delivery issue and the cost scalability issue? Or does it somehow not translate as well on Facebook? Nick Unsworth: Yeah. So, here’s the thing. The biggest factor with Facebook advertising is it’s about building relationships with your ideal target market prospects. So, basically what we call it is a Facebook marketing funnel. And all that means is you’re gonna run an ad on Facebook and then what is the ad gonna go to, right? So, you’re wanting your ad to be something that is going to point him to a landing page, it could be a squeeze page, but it’s going to be a website page that gives you an opportunity to collect their email address. So, you have to kind of go on those baby steps. If you go from an ad on Facebook to “Hey, buy my ticket to my event coming up in April”, it’s flat out not gonna work. No matter how confident the company is, no matter how cool they think their event is, it literally never ever…It doesn’t cash flow is the point. So you want to go from a Facebook ad to a landing page. And the landing page, what we want to have there going on is I refer to it as a lead magnet. So, you want to be solving the problem. So, if you’re in health and fitness, you might want to target women that are engaged because you know they’re gonna get married. You know that it’s their dream to fit into that dress and look their best they’ve ever looked in their entire life. So whether they’re looking for the Sunkist glow and juicing and this and that or they want to shave 10 pounds off, that market is a hot market for health and fitness because there’s a need and they have a problem. So, a lead magnet for a fitness professional like me. Now, here’s my lose 10 pounds in 30 days free video training that walks you through my 7 steps, right, in how to do that. So what you want to do is you want to have your ad. You want to target very narrowly to that perfect ideal target market and then when they see your ad in either their news feed or picture in Facebook on the right hand side and they click on it, you want it to be something that you’re solving the problem. It’s a lead magnet. And when they click on it, they’re gonna enter their information to get this. So this might be a webinar where you’re gonna teach you something live. It might be a video training, it could be a PDF report, but you’re going to give them something of value that’s gonna help them solve their problem, make their life better, whatever that may be for your niche. And the purpose behind that entire funnel is it really is just about building rapport. It’s no different than me and Jason meet for the first time and we’re mutual friends and we’re at a bar or something, I’m not gonna try and sell him something, he’s not gonna try and sell me something. So, we gotta walk before we run. Jason Hartman: You gotta warm up the relationship, date before you marry. Make sense. Alright, so talk about engaging with Facebook. We talked a little bit about the offer and maybe the baby steps to it and that all makes perfect sense by the way. But let’s talk about how you use Facebook. And one of the questions I really want to ask you, and of course there are other parts of Facebook advertising, but one thing that’s relatively new is my understanding is where a marketer or a company or any business, they may already have an email list where they’re dripping emails out, newsletters, whatever, to their followers, and for example one of my companies. We have a list of about 51,000 on our email database. And I hear now that you can actually upload that list to Facebook rather than coming to Facebook and saying, hey, this is who I want to hit and they tell you this is how many people I can find in San Diego, California that are interested in bicycles, etcetera, right? Here, you take your own list and you give it to them which I’m sure the data mining people just love. We got people providing our list to Facebook but how does that work? Nick Unsworth: Yeah. And this is a great topic because there’s a couple things I want to just throw out there before I drill down into this. So, basically, if you think about on Facebook when you’re running your ad, the most important metric, everything we teach, everything we do, it all revolves around click-through rate. So, click-through rate just means how many people are seeing your actual ad on Facebook versus how many people are physically clicking on it. And what happens is when your click-through rate is high, Facebook will automatically completely drop your cost per click. So all that means, if we make it as simple as possible, is the more engaged in your ad is and the more people want to click on it, your ad costs are gonna be way lower. So it’s the opposite of common sense, but what happens I that that one metric means we can consistently spend a fraction of what our competitors spend because we put up ads that had people smiling. We put up things on Facebook that are points to get people to interact. And the reason I bring that up is because, Jason, for what you mentioned, you’re referring to a custom audience. So, the great thing is that if you already have 51,000 people, then that custom audience, they already know you, so the fact that you put your face in a big smile or doing something fun whether it’s a real estate niche or whatever that is, you’re in front of a home that you just sold or flipped or whatever that may be, the cool thing is that they know you, so they’re more likely to want to interact with your ad because there’s some level of a relationship. So, therefore your click-through rate is gonna be a little higher. So, you might actually even have lower ad costs running that to your own network anyway. And so part of it is another factor is that advertising on Facebook, one of the beauties behind it is that you can be seen anywhere. It’s kind of like if you’re a local business, you walk into the chamber of commerce meeting, you want people to walk up and think you’re a celebrity, right? You want them to walk up like, man, that guy I see everywhere. You go to a big event like traffic and converters, you go to a party and it’s like, man, Jason, I see you all over the place. Man, it looks like things are good. Now, that creates perception. That creates branding, that creates authority. And most importantly, that creates buyers. So, the whole thing is that you might email your 51,000 people, but if they also see you on Facebook and on top of that maybe you used Google retargeting or remarketing and now they’re gonna see you throughout the Google network on various websites like Pandora and other sites, then people start to create this perception like, wow, Jason, you are crushing. I saw you on Pandora, I saw you on Facebook, and I saw you in my inbox on Tuesday. So, it’s really powerful to get from multiple spots. Jason Hartman: So, Nick, that definitely makes sense. You have to hit people on a lot of mediums. And the impression is very powerful to the consumer, to your audience. But tell us what one does. How do we upload our list to Facebook? And besides sending directly to that list but through Facebook and increasing our click-through rate as you discussed because those people obviously are familiar with us already and they’re going to be curious what they see us for on Facebook, does Facebook provide any information to us about our list? Like, do we get more details about it once we upload it to them? Nick Unsworth: There’s some really, really exciting things coming down the pipe with Facebook. So, Facebook has thousands of variations of data. I mean, just imagine all the information you have on your profile. Imagine all that. You might be on a random website and click the “Like” button. But what’s so interesting is that like button because it’s based on Facebook’s platform, that data can still be tracked back to one individual user. So, every time we click “Like” we’re actually compiling data for Facebook. And the reason Facebook cares about the data is of course for advertising. So, it allows marketers like us to come in and give it a drill down on a very tight knit demographic and that’s what makes it special. TV was so broad. It was so broad and so inefficient where now you can market to exactly who you want to and you can stretch your ad dollars. So, how you actually do that with a custom audience as it’s called is you can use a tool called the Power Editor. It’s an app that you install into Chrome. This gets a little techie, but probably the easiest way to describe it is to go to Google and just type in “Facebook Power Editor”, very simple to install into your browser, and then you can upload your email list. Now, the cool thing is when you do that, you can then import that into the Facebook Ad Manager, and the interesting thing is that they’re now starting to not only allow you to market to them, but by querying those actual email addresses, here’s the thing, you might have 51,000 email addresses but it’s only going to pull the people that that’s the email address that’s associated with their Facebook profile. Jason Hartman: So you’re gonna lose some. Nick Unsworth: You’re gonna lose some. Realistically, you’re gonna get a little more than half. So let’s just call it 30,000. But those 30,000, what’s nice is they’re starting to be able to pull not only the data to market to them, but to actually compile some information, the information that you typically had in the ad manager. So, some of the demographic information, that kind of stuff which can be very viable to get to know who your own audience is because if you looked at your 30,000 people and then you looked at what’s the makeup of their profiles and you say, wow, I’m attracted to way more women than I thought or whatever that may be, that will actually help clue you in a little further so that you can actually advertise towards that demographic. Jason Hartman: So, at first, a business person listening to this would be thinking isn’t this just a big insult? I mean, Facebook, talk about overreaching. They’re taking my own list and they’re saying, hey, pay us to advertise to the list you’ve already developed through our platform. Couldn’t someone think of it that way? Nick Unsworth: It’s totally possible. But on the other side, you make a few bucks from this and you’ll have to change your perspective. But here’s the thing. It’s their platform, right? So, we still have to display our ads on their platform. So, any time you’re taking up their online real estate, you’re going to have to pay for it. So, the cool thing is that even though it’s your own list, it’s no different than paying for an ad that you’re targeting for your platform. Check this out for an example: Put in $1000 like John Lee Dumas and John Lee Dumas makes back $19,000. Number one podcaster selling Podcasters Paradise. Last week, every week, he does these on Wednesdays and I trained Valerie. She’s one of my clients and we worked on his account. We heated 35 units, 35 units from Facebook ads. So, hanging out with him last week and it’s like what’s exciting to you right now? And he’s like Facebook. He’s like “I love what you and Valerie are doing”, right, so it’s cool. Jason Hartman: Makes a lot of sense. That’s great. So, explain the logic, if you know the logic or I’m sure you at least have some speculation about it as to why Facebook makes your ad cost lower as your click-throughs increase. Like, what would be their rationale for that? It’s sort of an interesting thing just to ask that high level question. Nick Unsworth: It is really interesting. So, here’s the thing. Facebook will always put their end users first because without the consumers on there, Facebook can literally crumble to the next network and be a Myspace very quickly. So, the whole thing is if they don’t put their people first, the everyday people that are using Facebook, then they always run that risk. So, the thing is that what’s interesting is that if the ads on Facebook become almost offensive or they become too salesy or in your face or just not fun, right, it’s actually gonna creep people out. Like, people aren’t gonna feel like they want to be on Facebook. Just psychologically, it’s not gonna be enjoyable. Think about marketers, right, and in your face ads. If they know you’re pregnant, if they know you have kids, if they know you have a disease, we know this now. We can figure this stuff out on Facebook. We can know who’s got what. Jason Hartman: It could be really tacky and annoying. So, if they’re just hounding you for that kind of stuff, yeah. Nick Unsworth: And to that point, they easily weed it out. Because if your ads don’t get clicks because people don’t like them, then they’re super, super expensive, very expensive. So, the beauty behind it is for advertisers your goal is to be fun and like smiling and it’s cool, so it’s a good win-win. Jason Hartman: Very interesting, very interesting. So, anything more about the custom audience? That’s really the biggest innovation. When did that come out? Nick Unsworth: Well, custom audiences, we’ve been able to do that for maybe 7 months through the Power Editor, 7 to 8 months. We have a very new ability to be able to pull some other information, it’s newer and there’s this thing called Social Connect. So, what’s interesting is that instead of asking for someone to opt-in via email, you can actually have them click a button called “Connect Via Facebook” and that will automatically pull their data. So, it’s technically an app, so I built a software company. I had this thing called Fan Reviews and what was nice is everyone had to quote aloud the app. So, we were able to pull lots and lots of data. And the reason why I got acquired was because there’s a billion dollar insurance company that really cared about data and the strategy worked really well for insurance agents. So, the Facebook data is great for big business. If you’re the little guy, I would just encourage you. The goal in Facebook advertising is getting very clear in your ideal target market. I know exactly who they are by age, by geographic location, and you’ve got to know the pages that they like. So when you’re advertising on Facebook, you never ever ever want to do broad audiences. You’ve got to zoom in and you’ve go to choose the “interest” section. And when you’re targeting on your ads, you want to make sure your ads are targeting towards people that like a certain Facebook page. So people are always like what page should I market to? And it’s who are your top 3 competitors? What are their Facebook pages? Would you want to have their customers? And if the answer is yes, perfect. Make it simple. Just target those 3 pages. And so the more narrow you can be, the better. And the beauty is I started on $100. That first $100, I targeted chief marketing officers. Imagine that, my first month in the business, chief marketing officers, and I end up getting a keynote speaking engagement in Hawaii, all expenses paid, and they paid me, and I used my first month. I mean, they thought I was a guru. They thought I was a big time expert. I was just getting started. But that’s the perception. Jason Hartman: Right, that’s the perception because you were present a lot in those ads. So, are these ads in the feed, are they on the side? Where are the ads? And do you know how many impressions they’re getting. For example, one person, say the person who hired you to do that speaking gig, how many times do you think they might have seen your ad? It’s this warm up concept, right? Nick Unsworth: Absolutely. So, what’s interesting about the frequency is so for chief marketing officers, and I drill down on age and location, so it actually wasn’t a very large segment. I mean, I was only marketing to at the time 7000 people. So, what happens is Facebook’s platform, they won’t show my ad to 7000 people. If I only have $100 budget, they’re not gonna stretch it to 7000. Facebook’s algorithm will intuitively look at your budget and say, well, this guy only has $100, so we’re only going to show his ads to 1000 people but we’re going to show it 15, 20, 30 times. So the frequency, what’s just very interesting to look at is you look at your budget and how come it’s not reaching all of the people I’m targeting? It’s because Facebook knows they have your best interest in mind, that they’re going to show it to your audience member multiple, multiple, multiple times. And what happens is that people need to see it 15-20 times. And some people can get annoyed by it, some people are “Man, this guy is just everywhere.” And that perception, if you’re in a business like mine or you’re an expert in something or a coach, it’s phenomenal because people perceive that you have authority when they see you advertising on Facebook. We’ve had people in the fitness niche, people in the dating and relationship niche that have “come out of nowhere”. They went from being the everyday person that had a passion – they maybe had a passion for health and fitness or juicing and then in 90 days they’re at the top of the industry where people are asking them to be on their shows and all that good stuff. Jason Hartman: That’s amazing. And what kind of budget over the course of those 90 days? I mean, of course it depends I know. But just give us an example. Nick Unsworth: Yeah. I mean, I think if someone were to come to me – my whole company with Life on Fire, here’s my main mission is I want to help people love what they do for work. So, if you’re listening to this or you had a job that you hate or you’re doing something that you know it’s not your full potential, maybe you know you’re settling, and if I ask you the question “Well, what would you do if money wasn’t involved? What’s your passion?” And picture my left hand out and that’s a circle, then the other one would be what are you good at? And what would you do if money was no issue? I mean, Jason, you’ve got a whole bunch of these really cool shows. I mean, you’re living your life on fire. You’re enjoying what you’re doing. Jason Hartman: Hey, it’s okay. So, in this one case, I’m gonna take this woman, Megan, I’m gonna help her build out a brand where she can make and distribute and sell juice. She can create a guide on how to juice. She’s gorgeous and she can be on video once a week and have a video podcast. And from that experience, once she has her show, she can reach out. I have no doubt in my mind that she can get someone like Jillian Michaels on her show. Just like you, Jason, how you’ve gone out and gotten Steve Forbes and these mega-mega names because you love entrepreneurship, you love this industry. So, for that person with a passion, she can go out and if she’s got enough guts…And that’s the big thing. The only thing that holds you back is your own guts and beliefs. And if she’s got the guts to go out and ask, she can bring on the experts. Just like me, I didn’t know everything about Facebook advertising but I found other people that did and I figured it out. So, if she sets that up, all we need to do is run some ads, get her some traffic. We gotta get her name out there. So, a person like that, if we’re talking about get to the top of the industry and be a pretty big name, I mean realistically I couldn’t have any kind of expectation like that without a $5000 ad budget. For anyone that’s getting going, could you come to me with $500 bucks and you’re hungry and you’ve got heart and we could set up a plan, absolutely because you don’t always have to spend a ton of money on ads, but we ‘d want to spend it, make a few bucks and reinvest it. Jason Hartman: Yeah, awesome. Good stuff, good stuff. Well, give out your website if you would and tell people where they can find you. Nick Unsworth: Okay, perfect. So, my company is LifeOnFire.com. And I’m super, super excited. We are rolling our podcast which is Life on Fire TV. So, we’re on camera and we’ve got John Lee Dumas as one of the top podcasters. Dude, Jason, we’re gonna be in Scotsdale, so I’d love to have you on our show, but it’s kind of like MTV Cribs. But we’re doing interviews, we’re doing Q & A and we’re also doing just cool inspirational messages and coaching. So, that’s Life on Fire TV is the podcast audio and video. And we also do this crazy thing called PayItForwardFridayTV.com. So, every Friday we run around on camera and do a random act of kindness, so it’s just fun little things, but for the most part LifeOnFire.com is your resource for what you need to love your life and live a life on fire. Jason Hartman: Hey, I love your pay it forward idea. Give us an example of some of the stuff you’ve done. Just one. I’ve had people that refused them. I had people that ran faster past me. I had people that were on bikes that kept riding. But then I had some people that stopped and said “What’s the catch?” And I was like there is no catch. I’m just doing something nice. And it’s so great to catch that on camera because it’s shocking. And we’re not used to having something nice be done for us unexpectedly. And the cool thing is that not only is it my goal to do something nice for someone else, but the reason we give two gift cards and would always try and inspire that person because as soon as they get it you literally can see their light bulb go off in their face and then the whole thing is can you inspire them in that moment for them to pay it forward for someone else? And what’s so cool is it’s been happening. So we’ve got all kinds of cool stories. Last week we had a compilation one of people sharing what they’ve done and it’s great to just do but it changes the way your life unfolds. I don’t know – I think I used to attract people that were rude because I probably had a frown on my face and now I’m just a smiley guy and now it’s like I attract a lot of smiles. It’s just a fun way to live and it’s a cool show. Jason Hartman: That’s awesome, that’s awesome. Good to hear, good stuff. Well, Nick Unsworth, CEO of Life On Fire, thanks for joining us today. Nick Unsworth: Thank you, man. See you guys. Narrator: This show is produced by The Hartman Media Company, all rights reserved. For distribution or publication rights and media interviews, please visit www.HartmanMedia.com or email [email protected] Nothing on this show should be considered specific personal or professional advice. Please consult an appropriate tax, legal, real estate or business professional for individualized advice. Opinions of guests are their own, and the host is acting on behalf of Platinum Properties Investor Network, Inc. exclusively.